Every week of the pre-season, we will post our take on any news that comes through. We’ll get sucked in by who’s burning up the track, getting more midfield time and those who are locks even though we are weeks away from locking our teams in. This is anything goes and we’ll be updating the rolling blog regularly. Come back, have a read and get involved in the discussion in the comments. Click here for details on creating your pre-season Fantasy Classic team and join the discussion. LAST UPDATE: Sunday 8 January, 2017. Fit Fyfe in top shape – All we need to hear about Nat Fyfe. Looking good, without getting ahead of himself. Crow primed to step up – Brad Crouch had an interrupted pre-season last year. Sounds promising as he has been touted to be the Dangerfield replacement. The jury is still out on who the best brother is. Kokoda bond to help usher in Hawks’ new era – Only thing really to note is that Kieren Lovell was the man to say some words. Hopefully he is set to suit up round one. If so, a lock invthe FWD line. Calvin has posted his article on AFL.com.au along with the prices for the Crows. We’ve been wanting him in our Fantasy teams for a while, but could 2016 be the year we get a fit Nathan Freeman (MID, $150K) that is ready to go in round one? The perennially injured Saint finished fourth in the 3km time trial today behind Jarryn Geary, Daniel McKenzie and Ed Phillips. Warnie has posted his article on AFL.com.au along with the prices for the Eagles. In an article on AFL.com.au, Mitch Duncan says that Patrick Dangerfield (MID, $712K) and Joel Selwood (MID, $619K) will push forward occasionally to help the young midfield brigade develop. New Docker Bradley Hill (MID/FWD, $417K) won the club’s second time trail after taking out the 3km time trial in November. Cam Stucliffe, Tommy Sherridan and Josh Deluca finished ahead of Nat Fyfe (MID, $595K) who is looking the good this pre-season. Roy has posted his article on AFL.com.au along with the prices for the Roos. Pick 9 at the 2015 Draft, Sam Weideman (FWD, $150K) is keen to earn his opportunity early on to hold down a place next to Jesse Hogan in Melbourne’s forward line. The 19-year-old played three games this year, scoring 50, 22 and 29 – hardly anything to write home about. His VFL numbers weren’t huge either averaging 53 from 15 games. Despite this, it is probably worth pencilling Weideman on your FWD bench for the basement price if the 195cm forward is named in round one. Expect much of the same from Toby Greene next season. The FWD averaged 92.7 last year. “I think I’ll stay as a forward next year, there’s too much to do in the midfield,” he joked. “I haven’t sat down with Leon (Cameron) yet to discuss it in detail, but I’m keen to play a similar role to last season, playing as a forward with the occasional run in the middle. “I’ve just got to keep doing the same things I’ve been doing, and that’s keeping my head down and training hard. “With Brett Deledio working with us now, he brings a different dynamic, and he’s on fire at training so it’s great to be learning off those sorts of guys. 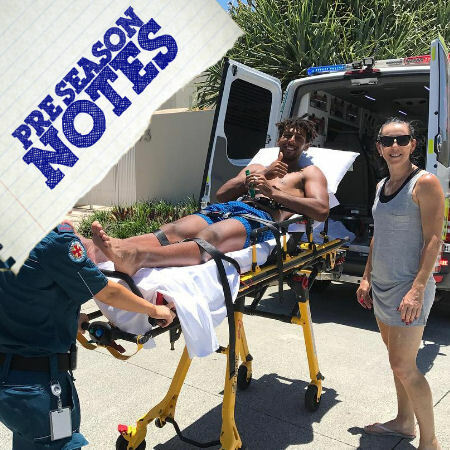 Brisbane Lions’ second ruckman, Archie Smith, had to have a barb removed from his foot after treading on a stingray on New Years Eve. He says he should be right in a couple of weeks. This will be interesting to monitor as the biggest question over Stefan Martin’s place in our Fantasy teams is whether he has a second ruck next to him – which would obviously be Archie. Second year Bomber Darcy Parish has added seven kilograms in 12 months and aims to get to more contests and finish off games stronger in 2017. He notes he is learning off David Myers and Dyson Heppell. Parish averaged 72.63 points last season from 19 games. Warnie has posted his article on AFL.com.au along with the prices for the Saints. Tiny typo Warnie. 2017, not 2016 for Nathan Freeman.